The NCSM eNews is published monthly. Please consider forwarding this eNews to a colleague-let's get everyone involved in the conversation! What's New at NCSM: Digital Learning Initiative and the PLC App- We WANT you! The Digital Learning Initiative committee is seeking leaders who may be interested in developing module content, identifying supporting resources, providing case studies, or reviewing or piloting developed modules. If you are interested in joining the team, please complete the FORM. If there are questions related to the PLC App or the Digital Learning Initiative, please contact Marc Garneau. 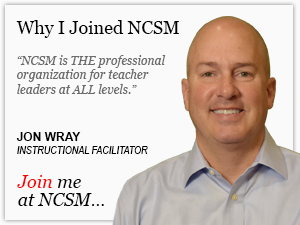 Welcome to NCSM's newest affiliate! NCSM is excited to welcome the North Carolina Council of Teachers of Mathematics(NCCTM) as our newest affiliate. Julia Kolb is NCCTM's president and Debbie Crocker is serving as the NCSM representative. NCCTM sponsors a Fall Leadership seminar, a Fall conference and awards for outstanding teachers and student teachers. They give an annual Rankin award for exemplary math education accomplishments. We welcome them to the NCSM Affiliate family! NCSM understands that mathematics specialists and coaches at all grade levels need specialized resources unique to their needs and the coaching corner was created to provide such materials and tools. 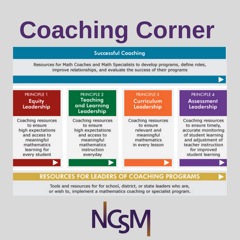 Please explore the NCSM Coaching Corner by clicking on the Leadership Principle of your choice! Join ONE MILLION students, teachers, math leaders, and adults from around the globe in an astounding mathematical experience! Global Math Week is October 10-17, 2017. For more information and how to register, click HERE. Here's your chance to spread the word about NCSM. Not only can you help support a colleague's career, but you might just earn some exciting rewards doing so. For every new member you refer, you will receive an entry into a drawing for a free conference registration. Refer 5 new members and you will get a set of books and 5 entries into the drawing. Refer 15 or more and you will get special recognition at the 50th NCSM Annual conference. This program runs till October 1, 2017 so spread the word! Winners will be recognized in the October E-news. Mona Toncheff is pleased to be NCSM's eNews Editor. Please feel free to contact Mona with news, feedback, or suggestions. We know that a strong mission and vision are critical for the success of any organization. A mission statement defines an organization’s primary purpose, objectives and why it exists. The vision statement provides guidance and inspiration for an organization by identifying what the organization wants to accomplish as they focus on their future. At the NCSM summer board meeting we reviewed our mission and vision statement and decided that it was time to review and refine these statements to reflect our current goals and actions. In July, the board unanimously approved the revised Mission and Vision Statements and they are listed below. Mission Statement: NCSM is a mathematics education leadership organization that equips and empowers a diverse education community to engage in leadership that supports, sustains, and inspires high quality mathematics teaching and learning every day for each and every learner. Vision Statement: NCSM is the premiere mathematics education leadership organization. Our bold leadership in the mathematics education community develops vision, ensures support, and guarantees that all students engage in equitable, high-quality mathematical experiences that lead to powerful, flexible uses of mathematical understanding to affect their lives and to improve the world. These two statements have already guided and informed decisions and actions I have made and will continue to make as your president. Our work as a board this year is focused on bold leadership actions that continue to support mathematics learning for each and every learner. As NCSM celebrates the golden anniversary and we look towards the next 50 years, I believe these two statements represent our members’ purpose, values and goals and will guide our organization efforts to support mathematics teacher and leaders to impact mathematics learning for each and every learner. As you are making preparations to join us at the 50th Annual Conference in Washington D.C., I hope you will consider joining us for a special celebration event on Monday night, April 23, 2017. Big Ideas Learning and National Geographic are joining us as sponsors for the event. The 50th Celebration event will be hosted at the National Geographic Building a short distance from the Convention Center. We are working on an exciting program that is fast-paced, full of fun and entertainment a few times during the event. You will not want to miss! Busses will be provided for transportation and heavy hors d'oeuvres and drinks will be served as we celebrate our golden anniversary. NCSM will also provide shuttle service for reception ticket-holders from the reception back to the conference hotels. Space is limited for this event and we are asking those who attend for a non-refundable donation to the Iris Carl Fund of at least $19.68 (NCSM was founded in 1968). The Iris Carl Fund provides travel grants to support new leaders attending the NCSM conference. Tickets will be issued in the order registration and donations are received. We will maintain a wait-list for this event; if you are on the wait-list, we will let you know what to expect. It is going to be a fun evening with many surprises and I look forward to seeing you there. The Fall Seminar will be held on November 29, 2017 in Chicago, IL at the Chicago Symphony Hall. The seminar will run from 8:00a.m. to 3:00p.m. with breakfast and registration beginning at 7:15a.m. Lunch will also be on-site and part of the seminar. The seminar will focus on Using Equity & Social Justice to Build Mathematics Leadership, and participants will be provided with opportunities for professional learning, planning and networking for all grade levels. Leadership for equity require action to remove barriers and provide all students access to rigorous meaningful curriculum taught by highly effective teachers. Toward this end, mathematics education leaders must have clear, shared vision of mathematics teaching and learning that embraces high achievement for all students. The leader must recognize and support beliefs and mindsets of adults and students such that each and every student has opportunities and support to learn mathematics. Keynote speakers, Nora Ramirez, Linda Fulmore, and Connie Schrock, will provoke thinking, discussion, and action for participants to bring back to lead local professional learning on equity and social justice in mathematics. Participants will be learning together during this seven hour seminar for mathematics teachers, teacher leaders, coaches, consultants, professional developers, department chairs and district leaders of mathematics programs. Partipants will also strategically plan to bring back action to their local districts supported by ready-to-use resources. Start planning now for this exciting and important seminar as we learn together how to lead for equity and social justice in mathematics. Registration is now open! Additional information may be found HERE. 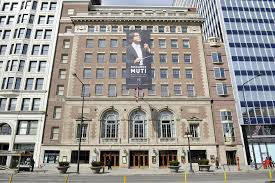 We look forward to seeing you in Chicago on November 29th at the beautiful Chicago Symphony Hall! Kay Gilliland gave her time, energy, services and skills to work for equity in mathematics education for all students, especially low-income, black, Latino, and indigenous peoples. Each year NCSM honors her legacy by presenting a person of like mind and work ethic with the Kay Gilliland Equity Lecture Award. The awardee will be invited to present their lecture at the 2018 Annual NCSM conference in Washington, DC in April. Click HERE to nominate a candidate for this award. Nominations are open through October 1, 2017. Colleagues across the nation are engaging in significant work to further ideas and passion regarding mathematics leadership and education. Please consider nominating a person you know who has made significant and describable contributions to the field through a dedication and concern for his/her fellow mathematics educators. This person should demonstrate a clear knowledge of mathematics education as well as contributing to the furthering of the stated purposes of NCSM: the interchange of ideas, cooperation with other professional organizations, and leadership in attacking current problems in mathematics curriculum and supervision. Please click HERE for a nomination form and criteria. The deadline is November 1, 2017. This grant provides professional learning assistance for mathematics teachers and mathematics teacher-leaders. For 2017-2018, a grant of a maximum of $4000 will be awarded to an elementary, middle or secondary school. The professional learning is for mathematics teacher-leaders and/or mathematics teachers within a school or district. Professional learning must focus on one of NCSM’s signature initiatives, Formative Assessment, Digital Learning or Access-Equity-Empowerment. Please click HERE to apply. The deadline is November 6, 2017. Do you serve in a mathematics education leadership role? The 50th Annual NCSM Conference will take place in Washington, DC in April 2018. If you are a current NCSM member (as of Sept. 1, 2017), and have not had the opportunity to attend this outstanding conference focused on cutting edge topics in mathematics education in the past three years, please visit HERE to apply for an Iris Carl Travel Grant. The deadline is December 1, 2017.